Founded on a cold New Year’s Eve of 1600, England’s East India Company is considered to be the mother of the modern corporation. Like most MNCs of today, creating profit for its shareholders was its primary objective. One of the means through which the profit was achieved, trade, is still a respectable means of profit in many MNCs. Another means, “corruption” also has an illegal but a clandestine existence in a few places. But the East India Company’s most profitable practice is all but vanished: Looting. Following the battle with Nawab of Bengal at Plassey, 90 miles north of Calcutta, in 1757 the Company loaded the treasury’s gold and silver onto a fleet of over a hundred boats and sent them downriver to Calcutta. In one stroke, Robert Clive, head of the Company’s private army (or Looting practice), had netted £2.5 million for the Company and £234,000 for himself. Today this would be £232 million corporate windfall and a cool £22 million success fee for Clive. It is perhaps better understood as the East India Company’s most successful business deal. Clive could easily teach “free cash flow” to Warren Buffett. Author Nick Robbins beautifully captures the 278 years of history of the East India Company (1600-1878) in the book The Corporation that changed the world. The book was written at the backdrop of Enron scandal. Not surprisingly, corporate social responsibility (or lack thereof) in a large organization is one of the central themes of the book. The book begins by articulating a painting (see the picture above) that got installed in their London headquarters, East India House in 1778. 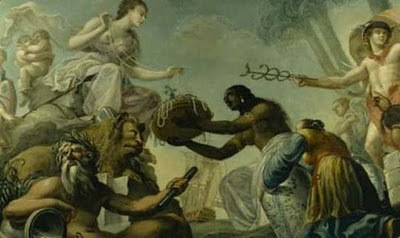 The painting, 10ft x 8ft, was titled The East Offering Her Riches to Britannia was fixed to the ceiling of the Company’s revenue committee room, where the directors monitored the flow of profit and loss. It was equivalent to a modern day vision statement and I feel it is a best practice worth emulating. At the heart of the painting is the relationship of three women, each representing her country. The scene is an Asian shoreline. Sitting high on a rock high to the left, a fair Britannia looks down on a kneeling India who offers her crown surrounded by rubies and pearls. Beside her, China presents her own tribute of porcelain and tea. From a grove of palm trees to the right comes a convoy of laborers carrying bales of cloth, along with an elephant and a camel, all directed westward by stern Mercury, the classical god of commerce. Do you still have any questions on the vision of the Company? In August 1765 Shah Alam II officially granted the Company diwani, a complete control of tax collection for more than 10 million people in Bengal. When the news of diwani reached London on 19 April 1766, the Company’s share stood at £165. Suddenly there was an ‘ungovernable impatience to be rich’ and a ‘contempt for slow, sure and moderate gains’. By the middle of June, the share price surged to £187 finally settling at £233 by Christmas. To get a larger slice of Bengal’s wealth shareholders met from noon on 18 May 1767 to 4am the following day on the dividend rate, eventually voting themselves an increase from 10 to 12.5 per cent. I find the book fascinating and I am sure to write more stories from the book on this blog. When we think of an innovation like say, the steam engine, we say, “James Watt invented the steam engine, manufactured it and made money”. This linear thinking from “idea” to “implementation” to “cash” (or “crash”) is too simplistic and hides an important non-linear process in the story: experimentation. For example, it doesn’t tell us that it took ten years of experimentation to demonstrate steam engine to public. Question is: what kinds of loops are involved in an innovation story? 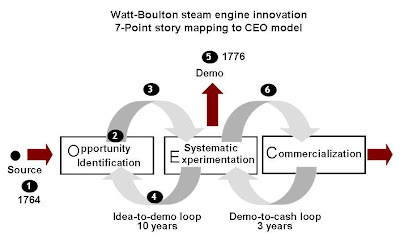 Let’s see two experimentation loops typically involved in the lifecycle of any idea using the Watt-Boulton steam engine story. We will first see the story in brief. 1. James Watt was a mathematical instrument maker to Glasgow University. In the winter of 1763-64 John Anderson, a professor of natural philosophy brought a small model of Newcomen engine (the prevalent engine model) for repair. Watt was perplexed by several aspects of the engine including the unexpectedly large quantity of steam consumed. 2. Watt started experimenting with the engine during the free time he got from his regular duties. After a year of experimentation he recognized that there is a paradoxical deficiency in the Newcomen engine. To utilize the steam efficiently, during the unpowered-stroke, the cylinder had to be kept at 100O C. But during the power stroke considerable cooling water had to be injected into the cylinder, this tended to cool the cylinder below 100O C.
3. Then one day, when Watt was strolling on the Green of Glasgow early in 1765, came his famous insight: he would condense the engine’s steam not in the operating cylinder, as Newcomen and all his followers had done, but rather in a separate condensing vessel to which it would be drawn by a pump or by other means. 4. For the next 10 years, Watt was to perform several experiments on cylinders of various sizes starting with small ones such as 1.4 inch, 1.75 inch, 6-7-8 inch and later on larger ones such as 18-38-50 inch etc. He also experimented with various materials such as brass, sheet iron, copper and wood. He also filed a patent in 1768. His work was funded by three investors, first by his friend Prof. Joseph Black, then by a businessman Dr. John Roebuck and finally by another businessman Matthew Boulton. Boulton also successfully re-negotiated the patent’s timeframe and got it extended by 25 years (till 1800). 5. In 1776 the first successful prototype was demonstrated with a 50-inch water-pumping model for a mine and a 38-inch model for blowing John Wilkinson’s blast furnaces. Both engines ran well and lead to favorable publicity. 6. From 1776 the firm began to install engines elsewhere. The firm rarely produced the engine itself: it had the purchaser buy parts from a number of suppliers and then assembled the engine on-site under the supervision of an engineer from their firm. The company made its profit by comparing the amount of coal used by the machine with that used by an earlier, less efficient Newcomen engine, and required payments of one-third of the savings annually for the next 25 years. In 1779 the firm hired engineer William Murdoch, who was able to take over the management of most of the on-site installation problems, allowing Watt and Boulton to remain in Birmingham. 7. Between 1775 and 1800 the firm produced approximately 450 engines. It did not let other manufacturers produce engines with separate condensers, and approximately 1,000 Newcomen engines, less efficient but cheaper and not subject to the restrictions of Watt's patent, were produced in Britain during that time. Watt, who started in business by borrowing, left an estate of £60,000 at his death in 1819. Boulton’s estate in 1809 was £150,000. This figure shows us the two experimentation loops: (1) idea-to-demo loop and (2) demo-to-cash loop. Note that the first loop is a decade long and it involved two investors (Black and Roebuck) running out of money. After the demo, it took another three years to stabilize the business model. Innovation is more like a marathon than a sprint with a few circular tracks in between! I think one thing that needs to happen is challenges need to be given to the organization. Let’s discuss about Tata Motors. In developing the small car, we have filed 40 patents in relation to the small car. Tata Motors since last year has filed some 200 patents; the year before we filed 30 patents. And probably if I go back, then for three years we didn’t file any. [Traditionally] know-how came from somewhere, we produced the product, we badged it ourselves or we put the foreign badges, put it into the market and in some cases, Indian companies were free to enhance that product, while in other cases they had no right to touch that product from what it was. I think that reduced the challenges to just meeting cost challenges in manufacturing etc. And therefore in manufacturing, we learnt from systems that foreign partners brought, we learnt from techniques that existed and we added some in India. We never really, except in the pharma area, tried to venture out on our own. And I think, many of our companies changed that. You know normally, if you want to do something, the normal reaction from the Indian manufacturer is who are the people doing this? See if I can get a JV with them and come to India. 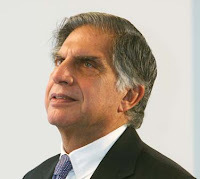 I think Rata Tata has aptly summarized the ethos that has been part of India’s industrial sector for several decades. Of course, it is changing today. We are not only thinking “products” but also thinking “platforms”. Alfred Chandler Jr., the father of business history as a discipline, would call it Economies of scale (How many million Nanos do you manufacture a year?) and scope (In how many models do you re-use the Nano platform?). While the concept of “scale” is not new to us, the concept of “scope” is. When Maruti announced that they are consolidating their platforms from 8 to 3 last year, the Economic Times article defined what a platform is: A platform is a common architecture for multiple car models that covers design, engineering, production and major components. For example, Alto, WagonR and Estilo are based on the same platform. Let’s hope that companies like Tata Motors and Maruti lead the innovation movement in the industrial sector of India and make it globally competitive. At an organization level “Number of patents filed” isn’t a perfect metric for its innovation stamina (see Edison and the patent paradox and how George Eastman of Kodak resolved it). However, “number of patents” is considered a good proxy for the innovation capacity at a national level. World Intellectual Property Organization (WIPO) data reveals that during 2009 India filed 761 patents as compared to China (7,946), US (45,790), Japan (29,827), Germany (16,736) and South Korea (8,006). One way to cheer up is to look who is behind. After India, we have Singapore (594), Brazil (480), South Africa (389) etc. IIMB Professor Rishikesha T. Krishnan has done a good job in analyzing India’s patent performance over the past 35 years in his new book: From jugaad to systematic innovation. Let’s look at the broad trends presented in the book. · The number of patents granted between 1995 and 2008 is about eleven times that between 1976 and 1994. · MNCs accounted for a little over half the patents in both periods. However, MNC patenting in the earlier period was largely (71% of MNC patents) in Chemistry related areas (primarily pharmaceuticals) while it was primarily in IT related areas (69% of MNC patents) in the later period. · Indian companies accounted for just 7.5% of all patents in the earlier period but account for 16% in the later period. Indian corporate patenting has been primarily in the Chemistry-related areas (82% of all patents awarded to Indian companies in the later period). · Indian research and academic institutions accounted for a little over 10% in the earlier period, but for as much as 22% in the later period. The Council for Scientific and Industrial Research (CSIR) is the top holder of US patents from India with about 990 patents granted between 1995 and 2008. The Indian company with the maximum number of patents has only one-tenth as many as CSIR. CSIR has received more patents than all the top 20 Indian corporate patenters together. · Top 10 Indian corporate awardees of US patents for 1995-2008 are Dr. Reddy’s Lab (98), Ranbaxy (83), Dabur (37), Indian Oil (33), Biocon (28), Orchid (28), Lupin (22), Sasken (21), Wockhardt (19), Reliance (19). Some people carry a vision so powerful that even after they are dead and gone, the momentum of the idea carries itself forward. Jamsetji Tata was one such visionary and his idea of “university of science” was one such vision. It was presented to the new viceroy Lord Curzon in 1898, the day after his arrival in India. Curzon expressed two major doubts: First, are there qualified Indians who would come for such advanced scientific training? Second, are there any employment opportunities for scientists in India? Both were valid questions. How did Curzon get these clarified? Before finding the answer, let’s look at Jamsetji Tata’s idea in brief. In September 1898, Jamsetji announced an offer that astonished men of his day. He decided to set aside fourteen of his buildings and four land properties in Bombay for an endowment to establish a university of science. His donation was worth Rs.30 Lakh (equivalent of Rs. 10 Crore of today). It was half his wealth. The other half he left to his two sons. What was Jamsetji’s vision? He felt – what advances a nation or a community is not so much to prop up its weakest and most helpless members as to lift up the best and most gifted so as to make them the greatest service to the country. According to the original plan – the university was destined to promote original investigations in all branches of learning and to utilize them for the benefit for India. This included – scientific and technological education; medical and sanitary education, including research in bacteriology; studies in philosophy and education (including method of education), ethics and psychology; Indian history and archeology, statistics and economics and comparative philology. How difficult would it have been for the new CEO to summarily reject the seemingly wild idea? However, an experiment was conducted to validate the doubts raised by Curzon. Secretary of state for India requested the Royal Society of England to send out an eminent scientist. Royal Society selected Prof. William Ramsay, the discoverer of rare gases like Helium and Neon (who was to get Nobel later). Prof. Ramsay was also to recommend a suitable place for such an institute. Ramsay did a quick tour of India in ten weeks. On Curzon’s first doubt whether the qualified students would come to the institute, Ramsay recommended liberal scholarships. On Curzon’s second doubt Ramsay indicated certain industries that could be developed in India. The Kolar Gold Fields and other mineral deposits favored Bangalore. In addition an imaginative dewan of Mysore, Sir K. Seshadri Iyer persuaded the Maharajah of Mysore to offer 372 acres of land. That finalized the place: Bangalore. Later Curzon appointed a committee to draw up a “less ambitious plan” susceptible to expansion according to circumstances. He asked the committee to submit a scheme whose annual expenditure will be limited to £10,000; £2000 of which will be provided by Govt. of India for 10 years. Jamsetji’s endowment alone provided £8000 a year. Jamsetji died in 1904. Finally, in 1905, Lord Curzon gave the green light to Dorab Tata by agreeing that government would meet half the cost. 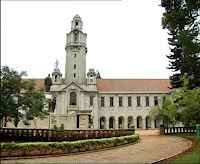 Indian Institute of Science (IISc) was born in 1909 and was operational in 1911 with three departments – General and Applied Chemistry, Electro-technology Chemistry and Organic Chemistry. The first Director M. W. Travers was a student of William Ramsay. Jamsetji was an amazing visionary. At the same time, I also appreciate Lord Curzon for being open to validating his doubts and Prof. Ramsay for carrying out a truthful experiment. Sources: The creation of wealth by R. M. Lala, Indian Institute of Science: the first hundred years by Prof. Srinivasa Ranganathan. “India has extraordinarily skilled technical talent but fails to create innovative products on a sustained basis” – With this paradox begins the book “From jugaad to systematic innovation” written by my friend Prof. Rishikesha Krishnan, a Professor of Corporate Strategy & Policy, and Jamuna Raghavan Chair Professor of Entrepreneurship at IIMB. I got an opportunity to attend the book launch last Friday at IIM Bangalore. The hall was packed and some people were standing. They had come to see the bridegroom (Rishi) and also to hear the bridegroom’s uncle, Subroto Bagchi (This is Subroto’s metaphor). This is a summary of what Rishi and Subroto said. Why did I write this book? One, to promote an informed discussion on the paradox mentioned above. Second, to present a systemic view on why India is performing poorly on innovation when benchmarked globally. This is in spite of the fact that we are out of license raj for more than 20 years. Central theme of the book is in Chapter 4 which explores “barriers to innovation” from various dimensions such as social, cultural, managerial, political and economic. Why are Indians not so innovative? A sardar in Ludhiana can produce a copycat marker pen efficiently. However, he will not ask, “Who is it being made for? Is it for a kid or Antarctica expedition team members?” The requirements may differ substantially. Innovation may begin at any of the three layers – engineering (bottom-most layer), experiential and existential. Indians are comfortable working at the engineering layers. When Nissan wants to introduce a car in Europe, it sends a team to experience “What it takes to be a motorist in Europe” And the team will experience driving in French Alps as well as on Auto Bann. To operate from the existential layer one needs to creep into the mind of the customer and then work backwards from the feeling. In order to creep into the customer’s mind, we need to learn to dialogue (as against debate or discussion). A salmon travels thousands of miles to hatch eggs. Out of the 2500 eggs that are laid only 2 will survive and grow up to hatch eggs. Similarly, there is a mortality rate built into the innovation process. Indian society is only beginning to understand and appreciate this. The book launch was a wonderful experience. I am hoping it was a trailer of the experience the book will create. Let's wish the book a review rating far better than Nelson's. You can purchase the book online here. Update: Kindle version of the book is now available on amazon and I have written a review there.